Autumn wedding decorations are a great way of showing off the splendid colors - orange, rust, sage, burnt sienna, purple, red and yellow of the Fall season - there is no mistaking that autumn colors bring out the beauty of nature. If your big day is set in autumn what better way to celebrate the occasion by taking advantage of all of these great fall colors? Think of grapevines, dried flowers, dried fruits and leaves, silk leaves and flowers when decorating the pews and aisle. Instead of using a bolt of tulle or fresh-flower garlands, you can opt for a fall-inspired garland. There are autumn leaf garlands or grapevine swags that you can buy for less than $4 per a 6-foot length. Scallop the garland on the pews and add some ready-made silk flower ball to hang at designated pews. Another idea is instead of the silk flower ball, just incorporate ribbons with the fall garland and then scatter gerbera and daisies on the aisle. Make sure you have an appropriate aisle runner so as not to stain the church's carpet. If the wedding is set outdoors, then why not consider jack-o-lanterns to light the aisle? Choose the colors of autumn for the altar floral arrangement. You can order from a florist and package it with the rest of the bridal and entourage's bouquets. Make sure there are plenty of orange and rust candles in the church to set the mood. Altar and candelabra arrangements should have the necessary items of fall - colorful leaves and flowers, berries, fruits, pinecones and acorns. Don't overdo it though. The venue dictates the type of autumn wedding decorations to use. If the reception is set at a garden or in a rustic setting (a barn or gazebo for example) decorating such venue would be minimal as the natural backdrop just had to be tweaked a bit. Drape grapevine swags on the gazebo's eaves and banisters. If the garden has an arbor, make sure it is properly covered with the necessary autumn flowers and leaves. If the reception is held in the ballroom of an upscale hotel, it would take a lot of decorations to cover the ballroom's decor that is not apt for an autumn wedding decoration. If this is the case don't fret. 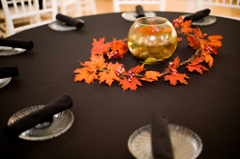 You just have to focus on the tables' centerpieces to create the autumn ambiance. Choose ivory, mocha or cream for the tables' base linen. Add a table runner from autumn's palette. 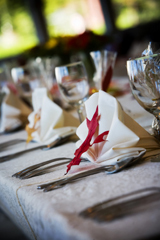 Scatter an assortment of silk autumn flowers or leaves on the table. Bow a complementing color of tulle on the chairs. This should set the mood for an autumn wedding decoration at the reception. For the centerpiece, a simple three autumn candles with varied heights set on a bed of silk leaves and dried acorn will add a dash of elegance on the table. You can also opt to go for a wicker basket, spray paint it in ivory, line it with grave leaves (dried or fresh) then fill it up with fresh fruits like apples, oranges, grapes, persimmons and some walnuts. Add some votive candles around the basket for effect. The guests can eat the centerpiece if they want to. Candle wedding centerpieces can be cheap. Choose a wide mouth clay pot bowl or an appropriately colored bowl that is shallow enough for floating candles. Fill the bowl with water and let float 3 to 4 maple or grape leaf candles. Accent with a stem of bittersweet set around the base of the bowl. Autumn wedding decoration ideas are endless. Imagine what you want for your autumn wedding and do it! Good luck with your own wedding decorations! If you have your own wedding decorations that you want to share or ask what everyone thinks then pop the photos on the form below, we would love to see them.